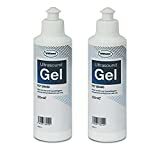 Ultrasound Transmission Gel (250 ml) Transound ultrasound transmission gel for diagnostic and therapeutic medical ultrasound. Recommended for all procedures where a viscous gel is required, including Ultrasonic diagnosis, Ultrasonic therapy, ECG, EEG, EMG, Defibrillation etc. Why Do I Need Ultrasound Gel? Applying a layer of ultrasound coupling gel between the Doppler sensor and tummy can ensure a clear signal for detecting the fetal heart beat. Doppler sound waves do not travel easily through the air and so without the use of coupling gel, high interference prevents a clearly audible sound. SONOLINE B FETAL HEART MONITOR . IN BLUE.